Dan Wenk, the superintendent of Yellowstone National Park, does not like killing bison. "Well it’s one of the hardest things that we do in the park, is make a decision on an annual basis to remove bison from the population." Wenk says the current practice of shipping bison to slaughter every winter is mandated by a settlement with the state of Montana. In 1995, Montana sued Yellowstone National Park to protect the state’s cattle industry from brucellosis, a disease ranchers fear could spread to cattle. Wenk says the park is looking for alternatives to the ship-to-slaughter program, and he believes many Montanans share that goal. "I think there’s a lot of people in the state of Montana who would like to see them managed as wildlife. But there’s a fear out there about what bison might mean if they could range farther on the landscape right now. I think we have to get beyond that." In January, Yellowstone released an environmental assessment of a plan that could shake up the status quo. The idea behind the park’s so-called “quarantine plan,” is to take bison from the park, keep them in quarantine until they are certified brucellosis-free, and then use them to help establish new herds in other places. The Park proposes setting up the bison quarantine on the Fort Peck Reservation. Robert Magnan is the director of the Fort Peck fish and game department. "We’re just trying to preserve the genetics of these animals and help other people get started." Under the park’s preferred option in the plan, Fort Peck would co-manage the quarantine process with the park. "As long as they’ve got buffalo to bring in, we’re ready. We’ve got the fencing, got the hay put up for ‘em, everything’s ready. The water’s for ‘em. Everything’s all set. All we need is just the animal," Magnan says. Bison being released at Fort Peck Reservation, November 2014. After the bison made it through quarantine – which could take a year for bulls, and up to two-and-a-half years for pregnant females – 70 percent of them would be given away to tribes and other groups interested in establishing conservation herds. Magnan says he knows of several tribes with and outside Montana who want them. "Wind River Reservation in Wyoming’s interested in getting some," Magnan says. "Cherokee Nation in Oklahoma is interested. We got a lot people wanting ‘em already. And we haven’t even got ‘em yet." Park officials are currently reviewing public comment on the quarantine plan, and will provide an update at next week’s meeting of the Interagency Bison Management Plan committee in West Yellowstone. However, the quarantine plan does not require approval by the IBMP. In fact, Magnan says the Fort Peck tribes have already been working with the park on more limited quarantine projects for the last four years. "We’re living proof. We got the animals here. Why stop at something you know works? Continue it." The World Wildlife Fund and other conservation groups are promoting the quarantine plan, but not all bison advocates are in support. The Buffalo Field Campaign and the Gallatin Wildlife Association have raised concerns about these wild animals becoming domesticated as they go through the quarantine testing process. And there’s critique from the cattle ranching community as well. "We do think that this needs more review," says Errol Rice. Errol Rice of the Montana Stockgrower’s Association says the plan needs more study. Ranchers are concerned that the proposed brucellosis testing regimen might not be rigorous enough to ensure that infected bison don’t slip through the cracks. "It really is precedent-setting as far as the expediency that bison would be allowed to go into quarantine and then out of quarantine to be translocated," Rice says. Park officials say a final decision on the plan will be made soon. But like the Fort Peck tribes, other Native American communities in Montana have already moved past the question of “if” they want to live with wild bison, and are beginning to figure out the how, where and when of bison restoration. Next Monday, 89 bison calves will be returned to the Blackfeet Nation from Canada’s Elk Island National Park. And the Confederated Salish and Kootenai Tribes are in conversation with the U.S. Fish and Wildlife Service, which announced in February, that it is considering transfer of ownership of the National Bison Range to the CSKT. All of this indicates that the bison restoration story has begun to expand well beyond the contentious borders of Yellowstone National Park. The Montana Board of Livestock is asking Montana attorney general Tim Fox to clarify the state’s laws pertaining to bison. Federal, state and tribal officials have agreed to kill as many as 600 to 900 Yellowstone National Park bison this year. Yellowstone National Park today said it will begin capturing wild bison on Monday. Several hundred animals will be transferred to tribal groups for slaughter this year. You may have heard a story on NPR about the new bison management policy Governor Steve Bullock has proposed. It would allow some bison to roam farther outside Yellowstone National Park, and remain outside the park year-round. Amy Martin reported that story and joins us now to tell us more about what she learned from talking to people in and around Yellowstone on her reporting trip. For the first time in 30 years, bison will be able to migrate outside of Yellowstone National Park. Park officials, private landowners and the state have been in a decades-long debate over the bison. Amy Martin reports for All Things Considered. Yellowstone National Park might tolerate thousands more bison by 2017, or perhaps hundreds fewer. State and federal wildlife managers are developing a new Yellowstone bison management plan and several options are on the table. 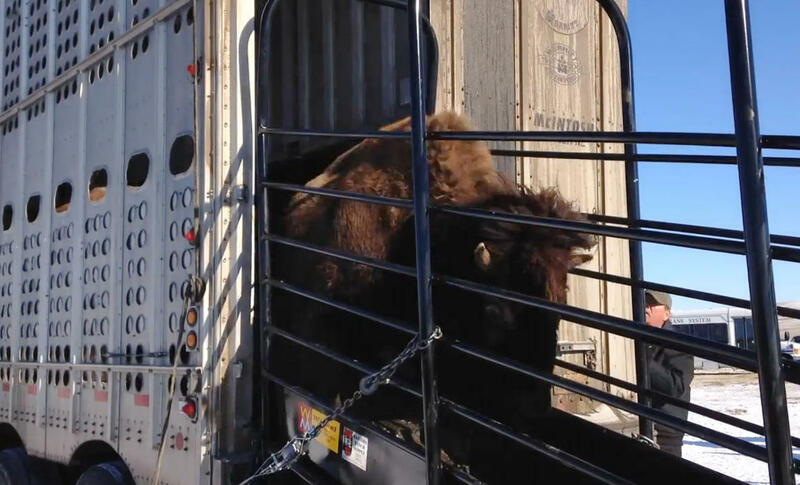 Nearly 2,000 pounds of wild bison lumbered out of a truck and down a ramp yesterday onto a pasture owned by the the Assiniboine & Sioux Tribes of the Fort Peck Reservation as members of the tribe greeted the animals with a song. Dozens of excited people were there to see workers herd the animals into a 140 acre holding pen. Fort Peck Fish and Game officials said almost 100 bison were unloaded yesterday, with nearly 50 more expected today. A herd of wild bison relocated from Yellowstone National Park arrived at Montana's Fort Peck Indian Reservation today. The bison were initially captured migrating out of the park, and were kept on media mogul Ted Turner’s ranch for the last five years. Tommy Christian is a 15-year member of the Assiniboine & Sioux tribal council. He says many tribes, including those he represents on Fort Peck, have a strong relationship with the animals, and have only recently been able to express it since hunters nearly massacred the entire species.